My relationship with a hot breakfast started very recently. There was such a humidity in my first winter in Mallorca that all of us ended up with bronchitis. Going down to the kitchen to have breakfast was a real nightmare. Having fruit and toasts for breakfast (even if they came from our amazing homemade starter dough) wasn´t enough to get by. So my boyfriend proposed to make porridge, as he had seen so many times when he was little. But of course, the porridge he ate in his childhood was covered with a white sugar layer (as soon as it was removed from the fire!) to sweeten it and I was reluctant to do so. I started to try with different versions, and my son didn´t eat anything, not even a spoon. Really big frustrating moment for a mum. And like everything in life, with patience and without forcing it, this breakfast so common in the countries of North Europe has found a place in our winter mornings. In fact, it has become so habitual that I almost no longer make bread! I usually make it with thin oats and sunflower seeds that soak in a lot of almond milk during the whole night. But since I discover this amaranth version, I try to alternate them. I must say that if you are not used to this flavour, you might not like it, especially children might not like it too much or who knows, kids are always so unpredictable! If your family doesn´t like too much the recipe with only amaranth, add a part of oats. What I like most of this kind of breakfasts is that they are open to infinite possibilities. 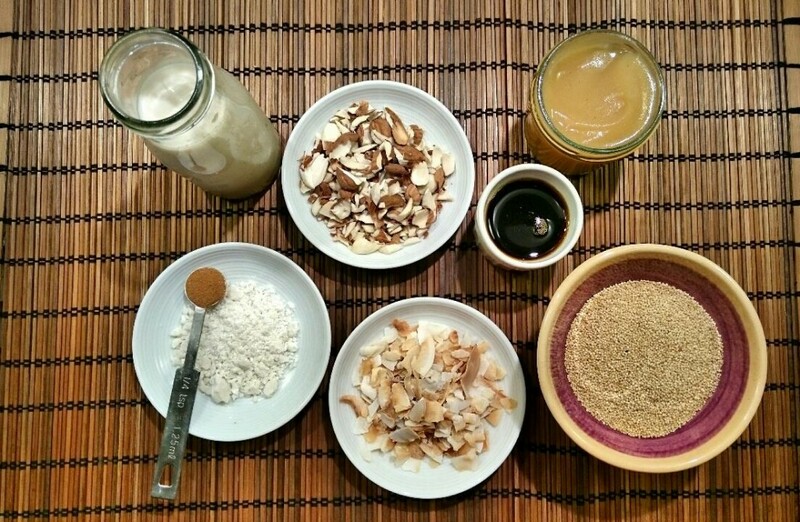 You can change the toppings, that is up to you: seeds, fruits, pollen, cocoa nibs, coconut, spices…you will never get bored! Every member of the family can choose whatever they want to put as a topping! This recipe is a perfect opportunity to practice this type of breakfast, so you can start using and getting to know the amaranth. We start from the complete ingredient, what on a nutritional level is infinitely better. 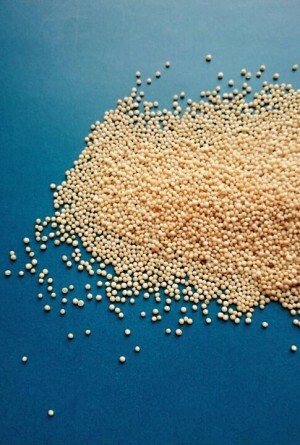 The amaranth, like the quinoa or buckwheat, are not cereals although they are used like cereals. It is known in South America and in India. It is a super strong plant and there are more than 500 varieties. Its green leaves are called “Chinese spinach”. 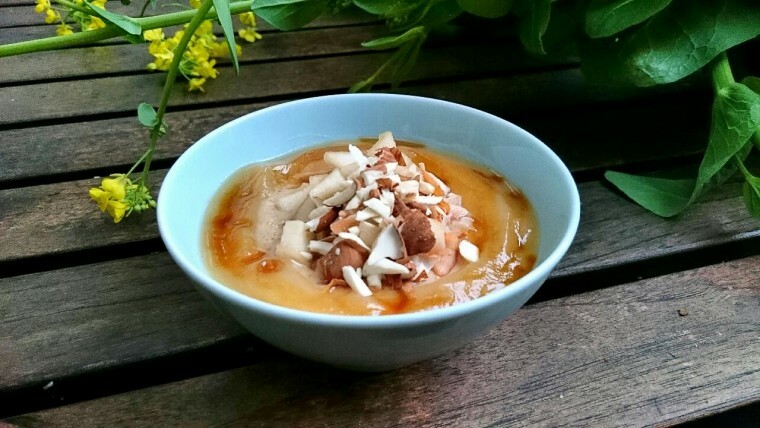 It doesn´t have any gluten and it is a mini nutritional bomb: it contains more protein than most of the lentils, more calcium than the milk and it is immensely rich in fiber and iron. And that is why it is perfect for children before going to school so we can provide them with lots of energy for a long time! (unlike all the puffed cereals (they are selling us just air!) which contain a lot of sugar and are not good at all in spite of the packaging saying something different). It is also beneficial for pregnant or nursing women and for people who have a job which requires an intense physical effort. In my next post I will explain you how easy is to make swollen amaranth to cook energy bars. The most important thing in this recipe is to soak the amaranth in water with a pinch of salt. This will help the cereal to get cooked faster and will make it easier to digest, as it happens with any other seed. If you prefer to do it with a part of oats, leave a bowl with the amaranth covered with water and another bowl with the oats covered with almond milk. After cleaning up the dinner, leave it with a strainer on the side to save time in the morning. I always try to prepare in advance a pan with a wooden spoon, the seeds or pieces of fruit that you are going to use, the coconut butter and the cinnamon. A cutting board next to the fire with a knife. The next morning you will appreciate this little help. And don´t get scared because you need to get a ladle dirty and cook it, it won´t take too long! If I can do it, you can also do it. As I always say, it is a matter of organization. Try to do for the first time on a Saturday when you have more free time. And your children, or at least their bodies, will definitely thank you. Remember that this recipe is simply a guide so give yourself time to find your own version little by little. My recipe usually contains cinnamon and fresh ginger which keep you warm and make digestion easier, coconut butter because the fat is very important to help absorb the vitamins and calcium, and applesauce (I always keep some around because I make it at home, simply by cooking apples with a used vanilla pod, and crushing it without the pod afterwards) because it helps to sweeten besides providing lots of flavour and honey. I am waiting for your alternatives and ideas! PD: the day I was writing this in the blog, I had for breakfast the porridge leftovers from the day before. OOOOHHH! It was delicious and with lots of apple flavor and besides that, I added nuts, something that enhances its flavor a lot more. I highly recommend it. It will look like rice pudding to you. So, you know already, if you have leftovers from the morning, you can put them in small glasses with applesauce on the top, nuts, a little of maple syrup and have it as a dessert! he previous night, let the amaranth soak well covered in water with a pinch of salt. The next morning strain the amaranth, rinse it and put it in a pan with the almond milk Bring it to boil. Reduce the fire and cook for about 5 minutes stirring from time to time. In the meantime, peel and cut the pear into cubes. When the milk gets reduced, try the grain, if you think it is not ready yet, you can add a bit more of water and cook it during three minutes more. 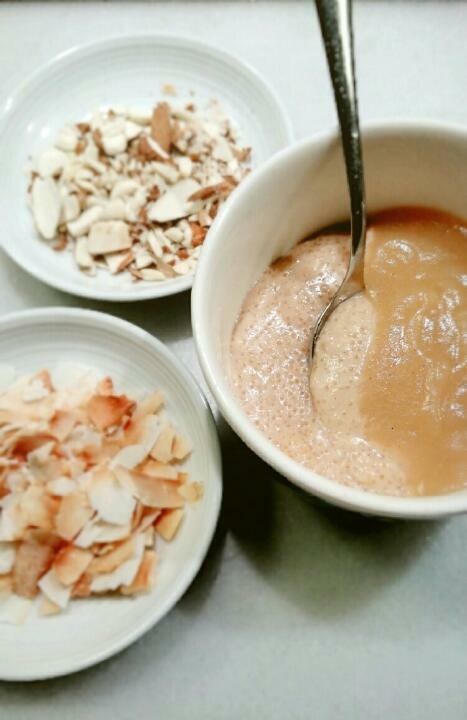 If it is soft enough, add the apple sauce, cinnamon, salt and coconut butter. Boil for 1 minute and put off the fire. Add the honey and divide it between two different bowls. Place over it the pear, the maple syrup, the remaining compote (cold) and the nuts.